The Krewe of Red Beans & Dead Beans kicks off its third annual “Road to the Final Fork,” a Bean Madness within March Madness, on Wednesday. The Carnival walking krewe with the artistic bean-decorated costumes organizes the culinary competition styled after the NCAA March Madness. Thirty-two New Orleans’ restaurants and chefs compete over a three-week, single elimination tournament to battle for the best Red Beans and Rice in New Orleans. The 2018 champion, Ma Momma’s House of Cornbread, Chicken and Waffles, 5741 Crowder Blvd., will defend its “Legume D’Or” title against 31 other New Orleans’ restaurants and chefs to battle for the best Red Beans and Rice in New Orleans. This tournament is participatory, calling on New Orleanians to both sample and vote in pop-up red beans taste tests, as well as sign up for brackets by Tuesday, March 19. Anyone who makes a a $5 donation can fill out a bracket, and participants will choose winners during the events at businesses and nonprofit locations. The winners each day advance to the next round. The most accurate bracket will win gift cards from participating restaurants (dine out every week for the year!) and silly prizes from the Krewe of Red Beans and its co-sponsors Camellia Brand Co. and Cajun Country Rice. The proceeds go to local nonprofits. Anna’s Place, Make Music NOLA, Market Umbrella, Sankofa, RIDE New Orleans, Southern Rep Theatre and KidSMART! are the beneficiaries of this year’s Bean Madness proceeds. Last year, more than 3,600 people participated, raising $8,000 for the selected nonprofits. 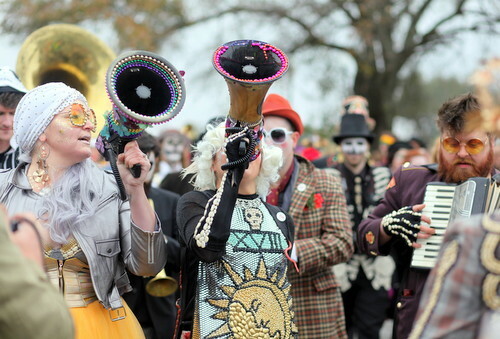 Elimination rounds happen at the “Sweet 6-Bean” — with two simultaneous matches — all day during a street party in Bywater. The final eight are chosen by all the people who attend and sample the beans. At the end of the day, the eight chosen advance to the “Great Plate” event on April 3. The single round elimination competitions are held all over town from Thursday through Sunday, with two Uptown on Sunday, listed below. To register and fill out a bracket, go to the Red Beans site. A complete list of events is on the Offbeat site.